Due to an immediate family member’s sickness the events scheduled for Saturday, April 27th and Saturday, May 4th have been postponed. An announcement for make up plans will be posted as soon as it is available. Emerging from an early side-by-side battle for the lead with Ross Bailes that lasted for several laps, Mt. Holly, N.C., driver Chris Ferguson took the point and rolled to a $10,000 victory in a 60-lap Schaeffer’s Oil Spring Nationals (presented by Sunoco Race Fuels) event held March 23 at Cochran Motor Speedway. The best of the best will be at Cochran Motor Speedway for the Schaeffer’s Oil Spring Nationals Super Late Model race! Come and watch the big boys of the southeast take on the ‘Battlefield’ Cochran Motor Speedway! Season Opening Weekend is set for March 8-9 at “The Battlefield” Cochran Motor Speedway! TWO HUGE NIGHTS OF BATTLEFIELD ACTION!!! Friday, March 8th will be our “Opening Practice” for ALL DIVISIONS! Plus, the Durrence Layne Chevrolet Winter Touring Series $2000.00 to win feature race!!!! UPDATED WORLD CHAMPIONSHIP INFO – Saturday Daytime Features!!!! 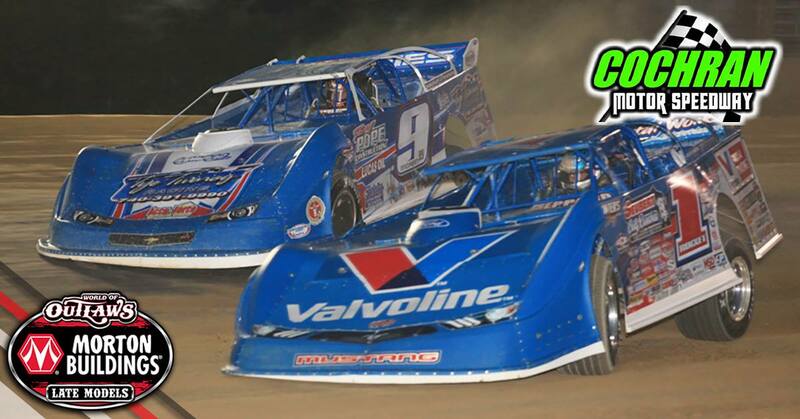 Cochran Motor Speedway updated their cover photo. Saturday Night's Feature Winners! Thanks to Tommy Bates for the GREAT photos of the victors!! !